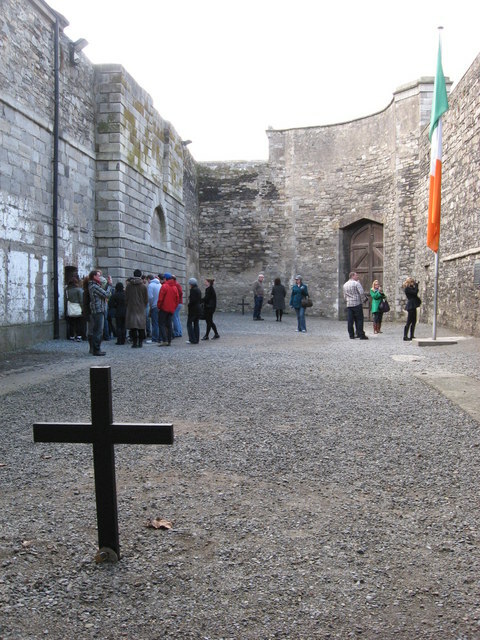 The stonebreakers' yard in Kilmainham Gaol; scene of the execution by firing squad of the 14 leaders of the 1916 Easter Rising. Over a period of a few days in May 1916, 13 of the 14 were shot at the location marked by the cross in the foreground. The other, James Connolly, unable to stand because of a leg wound, was carried by stretcher to the other end (the spot also marked by a cross now), tied to a chair there and then shot. This page has been viewed about 481 times.